Juliette Armand Color Control Cream / Gee Whiskers! I am a big fan of BB creams but I haven't really tried out many CC creams (Click here to read a post I wrote about the difference between BB creams and CC creams). 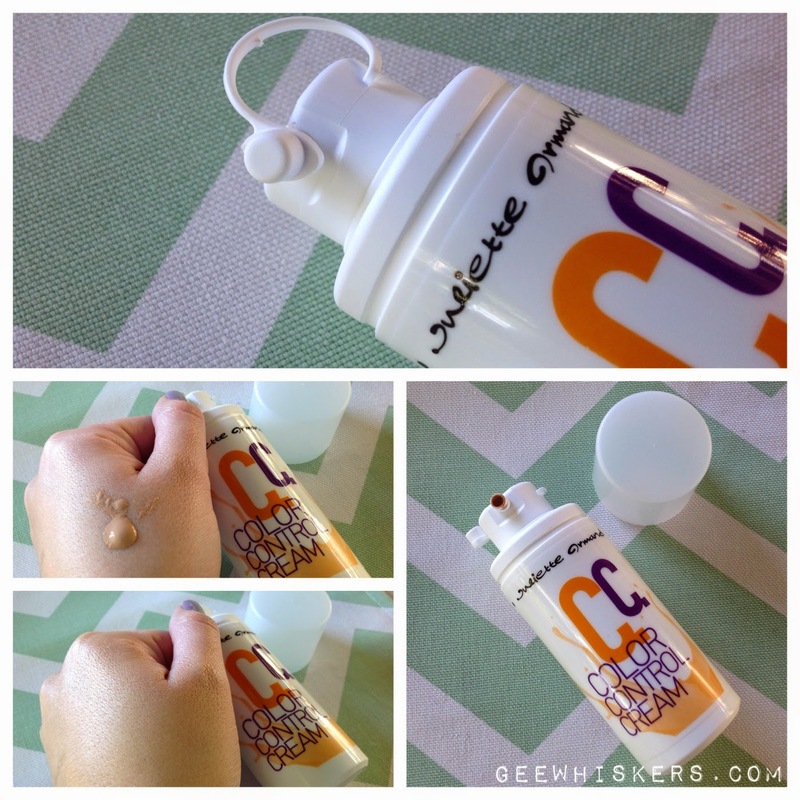 At a recent event I received a bottle of Juliette Armand CC Cream to test out. This CC cream only comes in one colour but it has seven different colour dispersions pigment to create natural coverage. The coverage is suited to fit most peoples' skin tone. However with my light skin tone, I have to either mix it up with some moisturiser or use a very small amount (as pictured above). Along with the coverage the cream contains Hyaluronic acid which offers fantastic hydrating properties; Vitamin PP which increases ceramides and fatty acids in your skin; Aloe Vera to moisturise and help reduce skin irritation and infamation in the skin; and SPF10 is added to the CC cream to help protect against UVA-UVB rays. The thing I like about this CC cream is that it has Matrixy 30000 tetrapeptides which help smooth wrinkles and fine lines. It also helps stimulate the production of collagen and fibronectin. All of these help gives you great coverage and healthy looking skin. The cream is not oily in texture and leaves a velvety finish on your skin. As I mentioned, because this is a "one colour fits all" cream, you need to play around with the amount you use to see what best suits you. Use a small amount at first and blend with a foundation brush. If you are not all that good with blending or don't have time, mix a small amount with your moisturiser. You won't get the same great coverage but I have been happy with the results when used like this. Overall, I really like this CC cream and have been reaching for it quite a bit, especially on days where my skin is a bit red and reactive. A 50ml bottle retails for R455 a bottle. Juliette Armand is brought to you by Poise Brands and you can call them on +27 11 033 0500 to find a stockists near you. This sounds amazing - something I'd love for summer as I use Estee Lauder Double Wear (a foundation that I stick with year after year as the coverage is lovely and it's the only foundation with a spot on colour match for me) but during summer I like to swop to something lighter.